It's Sunday, Sunday, Sunday inbound marketing nation! 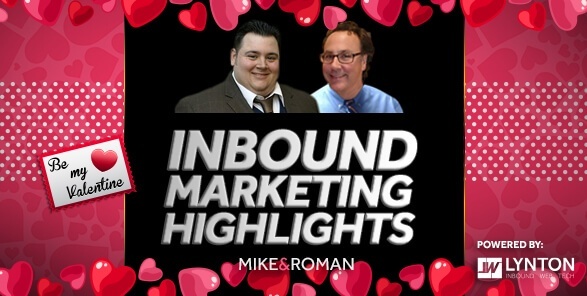 See all the inbound marketing highlights you may have missed from this past week. Has your Valentine's Day weekend been filled with love and romance (of the inbound marketing variety)? SMB's like social media. They really like social media. Especially for building awareness. Here is the money stat: 90% of SMBs use or plan to use social media. My only question is - what are the other 10% thinking?? It ain't easy being cheezy OR getting your content promoted. Here are some things that can help. P&G holds early gold in Olympic social media - USA Today. One word - slopestyle. Or is that two? Lots of good nuggets here that any biz can use to be effective on social. Fake likes? That is the ultimate form of hypocrisy. Is Santa not real? Click farms in India and Egypt? Definitely not the kind of farms the folks here at the Lynton Corral like. What the heck is graymail? "It's content that's perceived as spam-like, in that recipients often don't want the email and may mark it as spam out of annoyance -- but it doesn't meet the legal definition of spam." See what us marketers need to do about it. Ok, sorry, I know it's Sunday morning. Finish your coffee, get out of your heart pj's, have a great week and let's meet up next week - same time and same bat station.